OLA money offers 10% cashback when you load money to OLA money wallet. 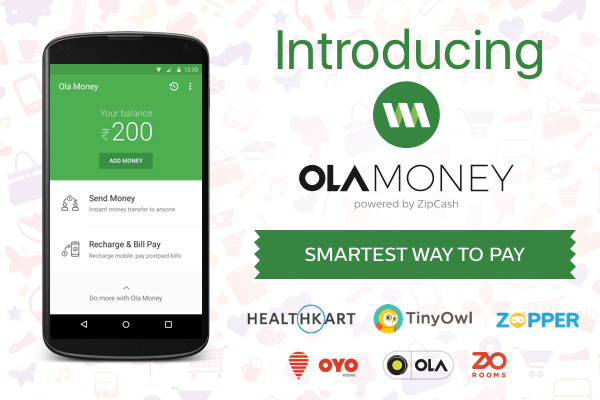 This OLA money app will act like a payment gateway approved by RBI for various online shopping sites. Best this about OLA money app add money offer is that this money can be used for mobile recharge and bill payments. OLA money is also transferable to other OLA money account. Get Rs 100 cashback on adding minimum of Rs 999. Maximum cashback limit is Rs. 100.Don’t be confuse with OLA cab app, OLA money is different app.20% cashback on adding money is exclusively working on OLA money app only is ended now. Ola coupons for July 2016 and August 2016 are updated. You can find much more offers like Rupay Ola Money offer and New Users Offers also. get exclusive coupons from Jonomus and get extra cashback on add money. 1. Can be used for mobile recharge,bill payments. 2. Can be used to pay OLA cab bills. 3. Can be transferred to other OLA money account. 4. Can be used making payment at various online portals,zopper,OYO Rooms,ZO Rooms,etc. Various deals and offers are currently going while making payment with OLA money. Offer valid till 16 August 2016. Offer applicable on maximum One lakh rides. Applicable only on Micro,Mini and Prime rides. To avail the offer minimum Rs. 50 ola money credits required. [Use Olacabs app] 10% Cashback on adding money via Payzapp. Only valid on those SBI credit card having Bin no. 517252681, 517252682, 472642684, 472642685. Valid only for selected users. Check your registered e-mail ID for that. 6. Make the final payment. 7. Rs 100 cashback would be added into your ola money account instantly. How to Use OLA money for Mobile Recharge,Bill Payments ? 4. Maximum cashback limit is Rs 100. 5. Offer only valid once per user. 6. Offer is valid only on first time recharges through Ola Money App. 100 Responses to "Ola Money Add Money Offers & Coupons : Extra Rs. 50 Cashback"
Bro,I have done all thing but they are not giving my money plz help .my olamoney I’d is . [email protected]. Danish bro I recharged three numbers via ola money app 1 week ago. But none of three recharges done and till now no satisfying reply from them. They are saying recharge has been done by their side but in ola money app , i am unable to see both three numbers in recent recharges. Please tell me should I do else contacting with them. I accused them on store and mail….